The couple's new kitchen, finished in 2011, makes wise use of a narrow space. The volume of an open cabinet maintains a spacious feel, with plate racks keeping daily wares in arm's reach. Sporting a bright-yellow finish, custom maple cabinets were treated with aniline dye. This process allows the natural grain of the wood to come through, lending subtle texture and an air of warmth to the space. For the room's color inspiration, Dave and Lu-in turned to the flooring "which explodes with color," she exclaims. brand of stove please. Fun exciting kitchen. Thanks! It looks like the range hood is over sized. Did you use a 36"range hood with a 30" range? It looks to me like it's the same size as the range -- follow the edge straight down with your eye and it is more clear. I do not have a better photo of this shelf unit. Are the cabinets painted? If so, What color, please? barn door rail over the exterior kitchen door - Hi It looks like you have a ben door rail over the exterior kitchen door. Does the door belong to a neighboring exterior door or cabinet? What brand is the door on rails? Look at one of the other photos -- a screen door hangs from the rail, and it retracts into a slot between the cabinets and the wall! I need that shelf! - Where did you find the stainless steel shelf above the range? Kitchen Backsplash - Who is the mfg of the backsplash tiles? Who is the manufacturer of the range hood? Please tell me about the window: manufacturer? are they casement? Beautiful! - What I the depth of the stainless steel shelf above the range? Could you tell me the colors code? - I would like to paint my Kitchen with these colors but I need the codes of them. The colours code of the furniture, tilings and walls. Thanks! 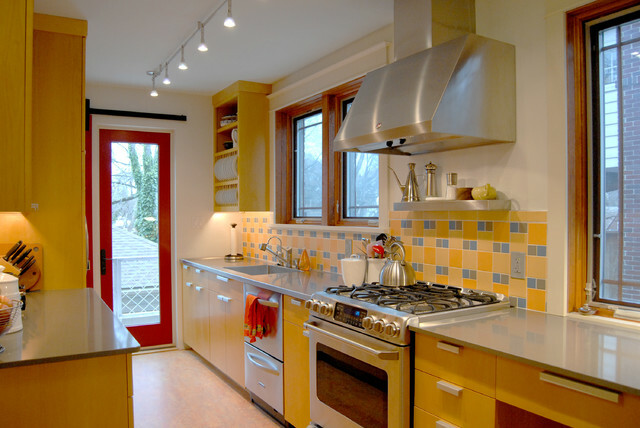 This charming kitchen features a nice mix of mellow and bold yellows. The small bits of red and blue add drama without going overboard on color. The new kitchen makes wise use of this narrow space. Open cabinets and plate racks contribute to the spacious feel and keep things within arm's reach.Cerrone designed custom maple cabinets with a bright yellow aniline dye finish. This process allows the natural grain of the wood to come through, lending subtle texture and warmth to the space. 3. Keep the sink close to the stove. As we age, it’s harder on our arms and backs to carry big pots full of water to and from the cooktop. If any spills on the way, it becomes a slipping hazard.You may be tempted to put your sink next to your stove, but be sure to leave workspace in between. It defeats the purpose if you’re forced to hold a pot longer than is comfortable because you can’t find a place to set it down. The kitchen sink is shallow enough to accommodate someone using a chair.